Good morning! Looking forward to seeing everyone at 10 am! Today we’ve got: Sweet salad mix, bunched arugula, loads of sweet potatoes all sizes, lots of papaya all sizes, onions, a few bunches of beets, pineapple, sliced and whole pumpkin, ginger root, turmeric, Italian basil, garlic chives, Italian parsley, recao, all of our peppers, zinnia flowers, ARTfarm chicken and turkey eggs. From our partners: Fiddlewood Farm’s fresh mild goat cheese and from Yellow Door Farm, more eggs, cinnamon, basil, lime basil, dandelion greens and ancho peppers. We love filling a skillet with only things we’ve grown on the farm. 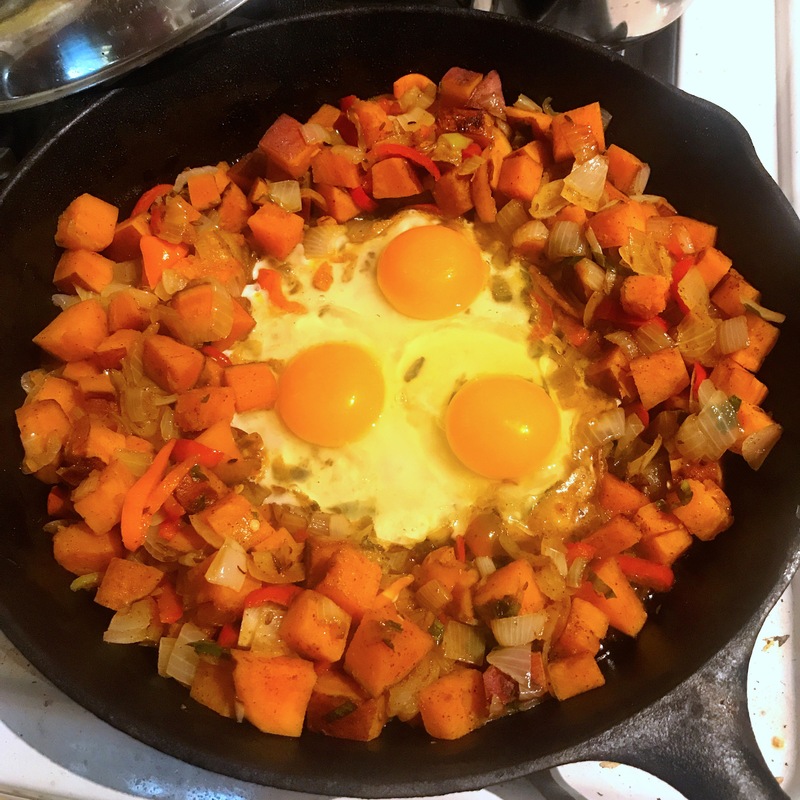 This ARTfarm breakfast hash is made from sweet potatoes, onions, peppers, turmeric and turkey eggs. Sprinkle a little goat cheese on top before serving! Turkey eggs are jumbo sized, very rich and with a slightly thicker consistency, similar to a duck egg. The shells are a little thicker to crack, and the protective inner shell membrane inside is also thick. So have confidence when cracking a turkey egg! It’s well worth the increased effort!